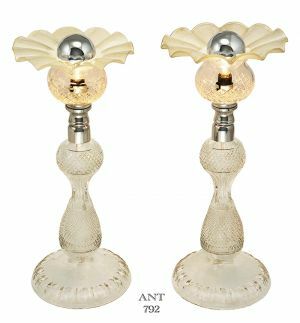 Pair of turn-of-the-century unusual cut crystal English table lamps. Standing a lovely 14 ½" tall, and 6 ½" wide (shade diameter), all parts of these lights simply state Quality. And the condition...marvelous! How different these two lamps really are!! They seem to mimic a flower, with the silverized top bulb being the center stamen and the ruffled cut glass shade being the petals. These lamps were NEVER made to light up a room...they were made to be accent art pieces. They produce a nice local glow, but really only for exclusive accenting areas of that room. They are more a statement of decoration than lighting. 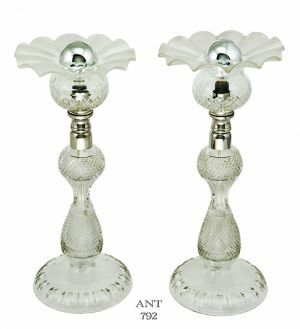 The quality is superb, with the cut crystal shades matching the bases. Never have seen a pair of lights quite like this. Actually...we received THREE of these...so a single could also be available. The shades are so unique...and just slightly different being free-hand crafted in some 100 year old glass makers shop. You can see they differ just slightly. These have been totally re-wired in our UL shop. We replaced the Edwardian English sockets with new American candelabra size (E12 base) sockets. These were installed inside the shell of the English sockets, since the English sockets actually secure the shade and could not be totally discarded. Clear cord with a cord switch was installed too. The bulb is a standard round silver topped bulb, so the light does not go upward...only downward for accenting the cut shade and area of the table. Silver crown bulbs are readily available. Nice accent. 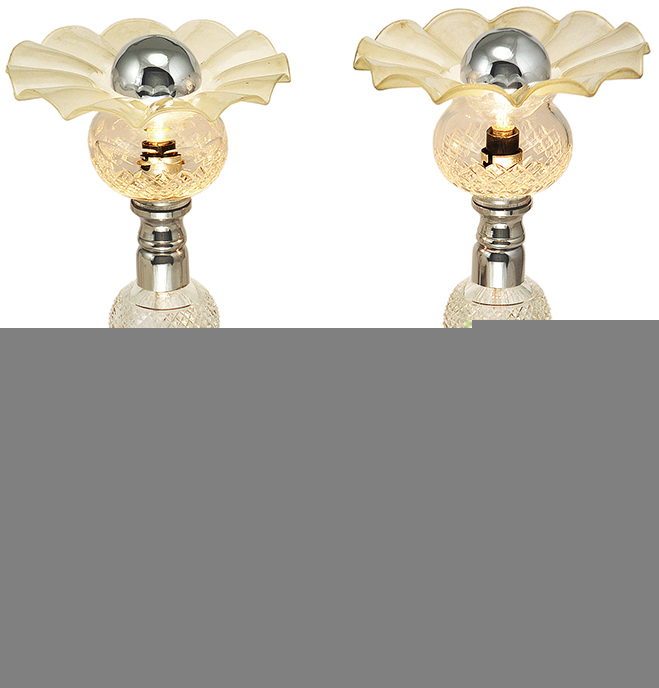 A wonderful and unique pair of cut crystal lights, which WILL come with the bulbs shown. Price for the Pair: $750.00 plus VERY careful packing and shipping charges.